How to cite this article: Patigaroo SA, Lone ZA, Batool QA, Qazi SM. Lincoln ’S Highway - A Forgotten Abscess. Heighpubs Otolaryngol and Rhinol. 2017; 1: 011-015. Copyright: © 2017 Patigaroo SA, et al. This is an open access article distributed under the Creative Commons Attribution License, which permits unrestricted use, distribution, and reproduction in any medium, provided the original work is properly cited. Introduction: Carotid space is a deep neck space within the carotid sheath. .Mosher called carotid sheath as the Lincoln Highway of the neck. Abscess in this space is rare to be seen by young Ear, Nose and Throat (ENT) surgeons in this era of early diagnosis and good antibiotics. We are reporting a case of isolated carotid space abscess in a 20 year old male to familiarize young surgeons with this abscess. Case report: A 20 year old young boy came to our Outpatient Department (OPD) with complaints of fever, painful neck swelling, progressive difficulty in swallowing from the last 7 days. Contrast Enhanced Computed Tomography (CECT) was done which revealed abscess located adjacent to carotid artery in the carotid sheath. Incision and drainage was done and carotid sheath was opened and pus drained .Patient was discharged after few days on oral antibiotics. Conclusion: Carotid space abscesses are rarely seen in developed countries. Tender and fluctuating swelling over the carotid artery area points towards it. CECT is the investigation of choice. Needle aspiration should be avoided especially by less trained persons. Small abscesses may respond to intravenous antibiotics but when frank and large abscess is formed, incision and drainage is the treatment of choice. Deep neck spaces are potential spaces formed by the compartmentalization of various divisons of deep cervical fascia of the neck. One of the deep neck spaces is Carotid space. This is a potential space within the carotid sheath. This space is also known as Visceral Vascular Space . It contains the carotid artery, and internal jugular vein in addition to the vagus nerve (CN X). It lies posterior to Parapharyngeal space, lateral to the retropharyngeal space, and anterolateral to the paravertebral spaces and medial to the parotid space and styloid process. The fascia has little areolar tissue and hence infections tend to remain localized. In 1929, Mosher called this fascia the Lincoln Highway of the neck because all three layers of deep cervical fascia contribute to the carotid sheath. This mental imagery was indicative of an important national event of his time, namely the creation of the first transcontinental paved highway in the United States. This was conceived 16 years earlier in 1913 . Infections of the deep spaces of the head and neck have been reported since the time of Hippocrates, Galen, and other authors under the names “morbus strangulatorius” “cynanche” (Greek forsuffocation), and “angina maligna” . Carotid space abscess is rare to see in this era of good antibiotics and early diagnosis and treatment. Clinically these patients present with painfully enlarged neck mass, pain, dysphagia, fever, hoarseness and dyspnoea. We are reporting a case of isolated carotid space abscess in a 16 year old male for its uncommon occurrence. A 20 year old male presented to our Outpatient Department of Ear, Nose and Throat (ENT) and Head and Neck surgery with the complaints of right sided neck swelling and difficulty in deglutination and an associated fever for six days. No other co morbidities were present. There was no complaint of difficulty of breathing. Examination revealed a tender firm 3x4 cm swelling in the right anterior triangle of neck extending from the lower margin of mandible above to the level of inferior ZDFSVVVXV of thyroid cartilage below figure 1. No other palpable neck swelling was noted. Oral and or pharyngeal examination revealed a bulge in the right medial wall of hypopharynx more in pyriform fossa figure 2. Neck movements were painful on the right side. Blood counts showed marked leucocytosis. X-ray of soft tissue neck was normal. 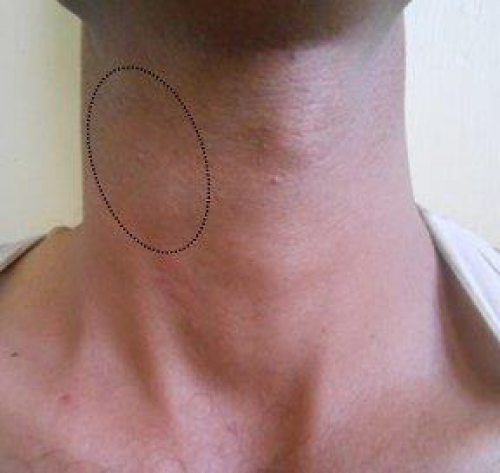 Figure 1: Swelling anterior triangle of neck on right side extending from mandible to inferior ZDFSVVVXV of thyroid cartilage. Figure 2: Flexible laryngoscopic picture showing obliterated right pyriform fossa (arrow) and normal left pyriform fossa (star). Contrast Enhanced Computed Tomography(CECT) scan was done which showed a well-defined cystic fluid attenuation lesion in relation to carotid sheath extending from C3-C6 level, with thick peripheral contrast enhancement and bulging medially into right hypo pharynx pushing right pyriform sinus interiorly figure 3. Marked confluent oedematous changes along adjacent subcutaneous tissues of neck were observed. No inferior extension into the mediastinum was found; neither any significant cervical lymphadenopathy nor other destructive osseous lesion was noted. Ultrasound (USG) guided Needle aspiration was done and pus sent for culture sensitivity on the day of admission. Patient was put on empirical therapy of clindamycin and ceftriaxone. The pus, however, showed no growth on culture. Abscess was then drained out externally via a transverse skin incision on next day of admission. About 20 ml of frank pus was drained out after opening the carotid sheath figure 4. Corrugated rubber drain was put in place and kept for 3 days. Acid Fast Bacilli (AFB) staining and Polymerase Chain Reaction (PCR) was negative for tuberculosis. Daily dressing with pressure application was done. The patient symptoms rapidly improved after that and was discharged on oral. No neck swelling was seen on external examination on 7th day of discharge figure 5 and even post-operative USG neck on 7th day showed no remnant/recurrent collection. Figure 3: Showing a well-defined cystic fluid attenuation lesion in relation to carotid sheath with thick peripheral contrast enhancement and pushing right pyriform sinus interiorly. Figure 4: Showing carotid sheath being opened (left picture), pus coming out and completely drained carotid space with overlying carotid sheath (arrow). 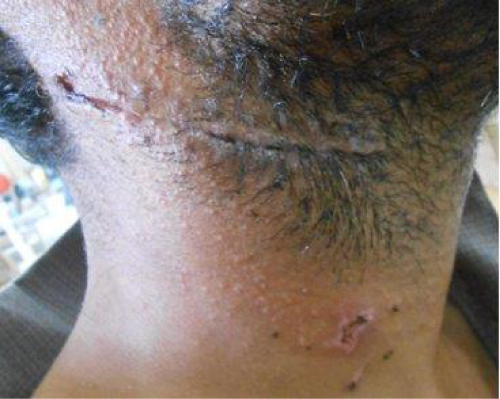 Figure 5: Follow up picture showing healed skin incision. Carotid space abscesses are rare to see in clinical practice. Patigaroo, et al. , in his study on pediatric deep neck space abscess found that only one patient had isolated carotid abscess out of 100 deep space abscess they studied. Our patient apparently did not seem to have any cause for infection but at the same time infections into the carotid sheath can arise from direct inoculation, such as from injection drug abuse or spread from adjacent neck spaces. The other causes are result of trauma to the upper aerodigestive tract or secondary to infection from surgical procedures like thyroidectomy. Less common causes are laryngopyoceles, thymic cyst, branchiogenic cyst, thyroid cyst, thyroiditis and branchial archanomalies . Our patient presented with painful neck swelling, fever and dysphagia. The clinical features of such abscesses are painful enlarged neck mass, chills, fever, sepsis syndrome, erythema, induration and tenderness of the sternocleidomastoid muscle, nuchal rigidity, contralateral torticollis and sometimes ipsilateral Horner’s syndrome, and vocal cord paralysis . We did not see any complication in our patient but complications of this abscess are well known. The complications of carotid sheath infection include internal jugular vein thrombosis (Lemierre’s syndrome), which is more common in injection drug abusers. Internal jugular vein thrombosis presents with pulmonary septic emboli and, in patients with a patent foramen ovale, with systemic emboli as well. The dural sinus is often also thrombosed. Another complication of carotid sheath infection is carotid artery rupture, which is associated with death in about one-third of patients. The internal carotid artery is most commonly involved. Rupture is often preceded by sentinel bleeding from the ear, nose, or mouth . Our patient did not grow any organism on culture. This may due to the fact that our Patient had received one course of antibiotics prescribed by their general practitioners before presenting to our hospital. Contemporary reports from different countries or areas may reveal different common pathogens . Most studies have determined the predominance of streptococcus and Staphylococcus aureus as a causative organism although often infections are polymicrobial . On the other hand, the presence of anaerobes may be underestimated because of the difficulty in culturing them . Recently, concern has emerged regarding the increasing incidence of Community Acquired-Methicillin Resistant Staphylococcus Aureus (CA-MRSA) infections presenting in the pediatric population . Patigaroo, et al. , found Methicillin Resistant Staphylococcus Aureus (MRSA) in high number of patients with pediatric deep neck space abscesss. (34 patients out of 82 cultures). The rising incidence of MRSA in pediatric neck abscesses has been linked to increasing morbidity . Diagnosis is made on clinical grounds along with radiological support. Cultures should be obtained before antimicrobial therapy but this is not always possible. Ultrasonography can guide aspiration and sometimes drainage of deep neck abscess. Contrast-enhanced CT scan carried out in the axial plane with 4-mm to 5-mm thick sections is standard means of imaging. Intra-venous contrast may help identify an abscess as a “rim-enhancing lesion” of abscess wall with a low-density center and tissue edea surrounding the abscess . Cellulitis is defined as soft tissue swelling with obliteration of regional fat planes. Although CT is helpful both in determining the presence and location of neck infections in children, it is less helpful in differentiating abscess from lymphadenitis and cellulitis . Magnetic Resonance Imaging (MRI) has not been shown to be more successful than Computed Tomography (CT) in distinguishing cellulitis or phlegmon from a true abscess collection. MRI scan can however elegantly show vascular complications such as venous thrombophlebitis or carotid artery narrowing CT is the most widely used imaging procedure . Less commonly accepted management of such abscesses include CT or ultrasound guided needle aspiration as there are chances of carotid puncture by needle. For uncomplicated small abscesses, the choice of using intravenous antibiotics alone versus incision and drainage plus intravenous antibiotics is up to clinician although incision and drainage is strongly recommended  when abscess is large as we did in our case. Most often the infections are polymicrobial (gram positive, gram negative, aerobic, and anaerobic) and beta-lactamase producing organisms must be anticipated. Therefore, therapy with Ampicillin-sulbactam with a third-generation cephalosporin such as ceftazidime is begun while culture results are pending . In an areas were MRSA is prevalent Clindamycin or any other anti MRSA agent should be preferred. We started our patient on Clindamycin and ceftriaxone. Once the results of cultures are obtained, targeted antibiotic therapy is recommended. 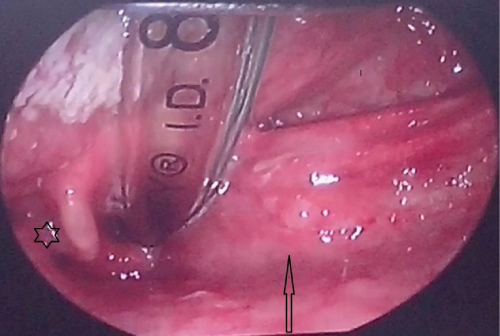 Carotid space abscesses are rare to encounter in routine clinical practice. Tender and fluctuating swelling over the carotid artery area points towards it. CECT is the investigation of choice. Needle aspiration should be avoided especially by less trained persons. Small abscesses may respond to intravenous antibiotics but when frank and large abscess is formed, incision and drainage is the treatment of choice. Cummings Otolaryngology Head & Neck Surgery. 4th edition Mosby. 2005; chapter 110.